Hyaluronic acid is a lauded skincare ingredient for good reason. It's a humectant with a molecule size small enough to slip down between skin cells and it can absorb many times its weight in water, which means mega hydration being drawn into the top layers of your skin! But while hyaluronic acid is common in eye creams, toners, and moisturizers, it still seems to be relatively rare in body care. 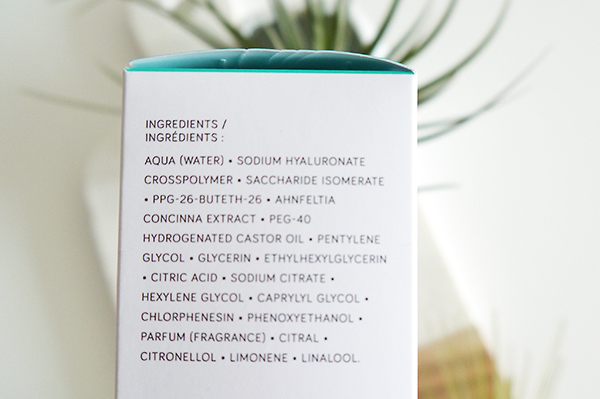 That's why I was so thrilled to find a body mist in which hyaluronic acid is the star ingredient. 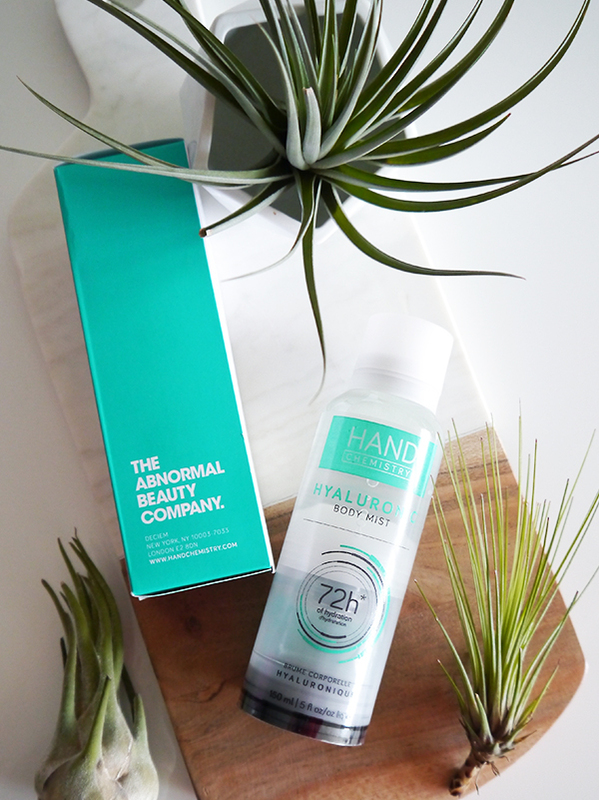 Hand Chemistry Hyaluronic Body Mist is formulated with a couple of other actives meant to deliver texture and tightness benefits (plant D-glucose, red marine algae), but otherwise the ingredients list is relatively straightforward. Sodium hyaluronate crosspolymer is listed as the second ingredient after water. The formula's lemony scent comes from fragrance, citral, citronellol, and limonene. Although the fragrance is strong right after application, the worst of it dissipates in about 5 minutes so you don't have to worry about walking around smelling like a Citronella candle. If you're used to the slippery sensation of lotion as your cue for "moisturized" skin, the feel of Hand Chemistry Hyaluronic Body Mist may take some getting used to. When it's first applied, it sits all over skin in a silky sheen, not sticky at all and cool to the touch. But after it absorbs all you feel is how your skin is hydrated and plumped from within; there's no layer of product sitting on the surface of arms and legs. Hand Chemistry Hyaluronic Body Mist promises long-lasting hydration benefits—up to 72 hours with a single application, in fact. I tested this claim by showering and skipping moisturizer the day after application, and even though my skin didn't feel as soft as it did the day before, it wasn't tight, dry, or uncomfortable. And bonus, even my husband noticed how much softer my skin felt! The non-aerosol spray nozzle produces an ultra-fine, continuous all-over mist and makes application a breeze. When I hold the nozzle about 12-18" away from my body, it just takes one pass over the front and back of each of leg, one pass over each arm, and a zig-zag motion over my torso and back. The whole process takes seconds. My top tip for application is to hold the nozzle far away enough to let the mist cover large areas (this will help the product last longer too!). I've read some reviews by customers complaining that they used up almost the entire bottle with a single application; to me that sounds like they were holding the bottle too closely to skin and the hyaluronic acid was being dispensed in concentrated spurts instead of the intended fine mist. It's the same principle as seasoning your food from up high as opposed to up close—you're going to get a more even distribution when you spray from farther away. 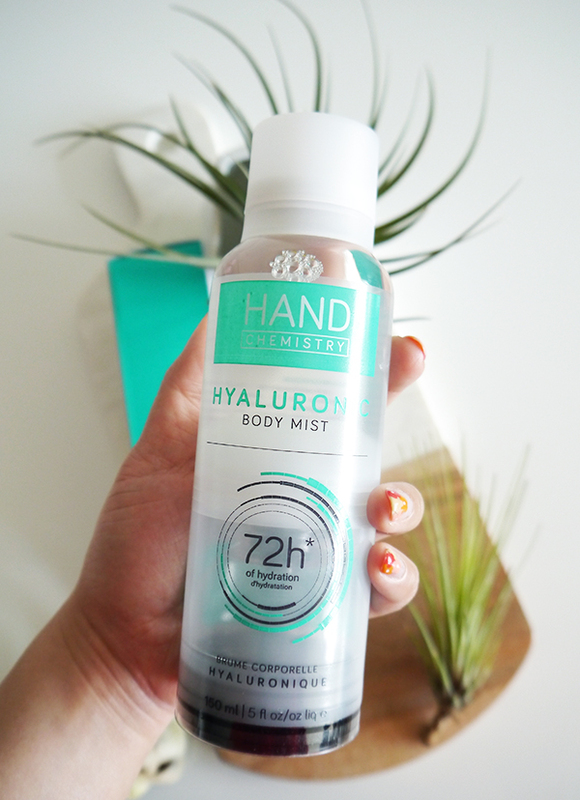 I love the idea of swapping Hand Chemistry Hyaluronic Body Mist for your regular body lotion during the hot summer months. 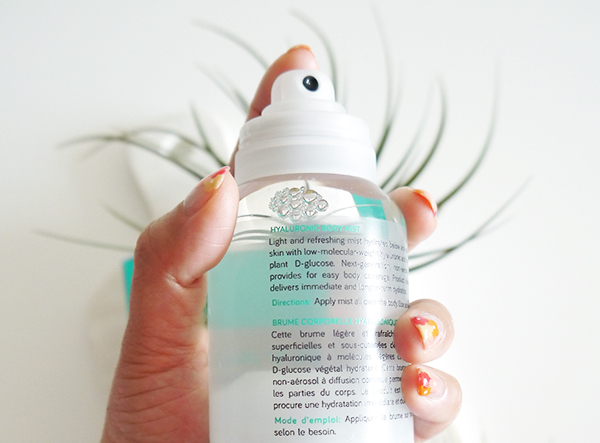 Lightweight texture and a cooling, refreshing mist that can be sprayed on hot limbs? Yes, please! Plus, it's a great product to layer under sunscreen—it's not sticky or goopy and it absorbs so quickly while providing the perfect hydration boost. I'm going to be reaching for Hand Chemistry Hyaluronic Body Mist often as the temperatures warm up, along with my sunglasses and my SPF. Oooh that looks interesting! I've never tried something like that but I feel like it'd definitely take a lot of getting used to, like you said. Yeah, I'm not a fan of how their founder is using social media either. I am so glad you picked this up! It's a weird product that you wouldn't think is anything special until you actually try it. I'm also glad you reviewed it despite the supposed backlash against the company. It makes me want to review a Deciem product as well because I have been hesitant in the last few months even though I still buy so much of their stuff. Thanks for talking me into the body mist that day! Yeah, I'm not a fan of how the founder is behaving on social media, but at the same time Deciem's business model is so successful for good reason—there's a demand for affordable skincare that really works. You can't put the genie back in the bottle. Hopefully they find a better balance with their social media strategy going forward. Before using this tool, I would like to receive a tester and make sure that it will suit me for my skin type. You can try it in Deciem stores.